For the last decade, the Arizona Hockey Union (AHU) has hosted the Icebreaker Invitational tournament in the Valley. This year, the tournament took place Oct. 6-9 at AZ Ice Gilbert and Ice Den Scottsdale. A total of 37 teams entered in eight divisions and there was plenty of excitement to fill the weekend. The AHU 16U AA Silver Knights went into the weekend with high expectations. Their first matchup pitted them against the McKinney North Stars out of Texas. The first two periods were defensive clinics with both teams being stifled at every attempt. Early in the third, the North Stars took the lead. Not to be outdone, Zac Yurkanin buried a feed from Max Chase, with Loren Lieberg assisting on the back end to tie it up. Seconds later, the North Stars again took the lead 2-1 and the Knights fell into penalty trouble, getting tagged for seven penalties in the third. With a short bench, they fell to the North Stars. This, however, would be their last taste of defeat. Over the next three games and into the championship, goalies Guy Blessing and Nathan Tepas dominated, allowing only two goals and posting a combined goals-against average of 0.80 throughout the weekend. In the final game, AHU Silver drew the Jr. Sun Devils. They continued their strong defensive play and secured the championship with a 2-0 win. Forward Frankie Demicco led the team in scoring with a goal and three assists, while the goaltenders each posted shutouts, giving up only two goals each. The team scored nine goals while surrendering only four and seven different Knights tallied a goal throughout the weekend. In the Pee Wee A division, 12U Black went undefeated on the way to the finals where they met the Vegas Jr. Golden Knights. Vegas finished their round-robin play not only undefeated as well, but without giving up a goal. The stage was set for a new rivalry to form. AHU Black started the scoring with a goal from Nathan Mclure and a shorthanded goal just over two minutes later from River Lewis. These were the first goals scored on the Golden Knights in over 12 periods of play. Vegas responded in under a minute to quickly slow any momentum AHU Black was gaining going into the second. The second period proved to be even better than the first. AHU Black came out firing on all cylinders scoring two more unassisted goals from Jeremiah Girnt and Matthew Benzing before Vegas potted one of their own. With 37 seconds remaining in the second, Kai Hohoff teamed up with Lewis and Benzing to put AHU up 5-2 heading to the third. Much of the third was a defensive battle with AHU holding the Golden Knights to seven shots before giving up two quick goals in the last minute of the period. 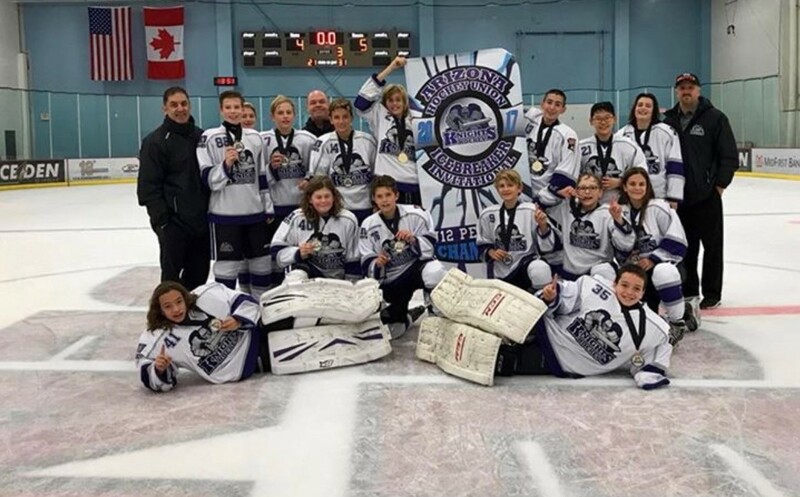 AHU Black not only scored the only goals of the tournament on the Golden Knights, but came together as a team, having five different players score in the game and capturing the Pee Wee A division championship. Hohoff led all scoring with nine goals and five assists, Lewis finished second with five goals and six assists, while goaltender Nathan Graybill stepped up and posted a 1.64 goals-against average for the weekend. The team scored 30 goals while only giving up 10. AHU Squirt Black, led by head coach Erik Brown, went undefeated for the weekend and won their first banner as a team in the Squirt 10U division (pictured at top). The other division champions included the Iowa Wild (18U AA), McKinney North Stars (16U A), McKinney North Stars (14U), Jr. Coyotes (12U B) and the Arizona Hockey Union thanks all the teams, from near and far, that helped make this tournament a success. Honorable mentions to the AHU Squirt White and Purple teams. Both entered the tournament in the Pee Wee B division, testing their players against bigger and stronger competition. White posted an impressive 4-1 record, falling in the finals and taking second place. Purple went on to secure third place in the division.